I did this watercolor for a colleague at work. This is Jackson, her cat and he was a stray she brought home one day after getting beyond the grief over the loss of her previous cat. I find watercolor a serious challenge and that it requires a far gentler touch than acrylics or oils which, as my long ago teacher Miss Hazel used to say you can “just slap some more paint over it” and cover up the flaws. The thing is, with their gentler touch, translucent qualities, I love watercolors. PS: If you really love this, you can by it in various forms, including print, canvas, notecard, even as a throw pillow here at this link. 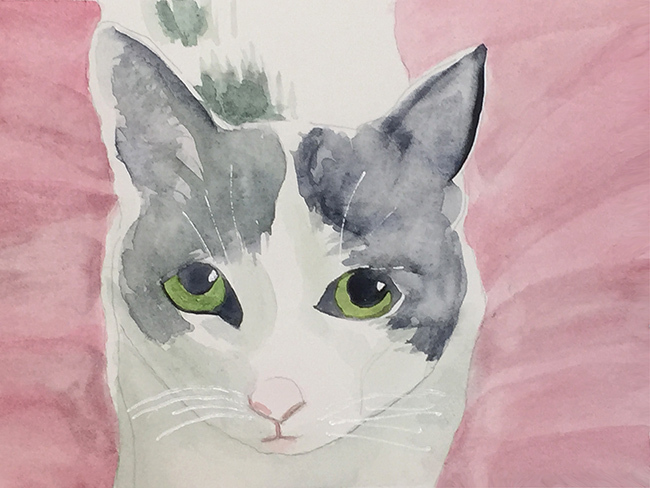 This entry was posted in watercolor and tagged Cat, colleague, translucent. Bookmark the permalink.